Tier im Recht (TIR) has been advocating for a strong legal protection of animals since 1996. The main purpose of TIR's actions is the continuous improvement of the human-animal relationship in a legal, ethical and social sense. TIR provides written advice and information over the phone upon request regarding animal-related legal questions and thus offers legal assistance in resolving specific everyday problems concerning animals. The library contains a whole range of scientific books and essays, and also media, newspaper, and journal articles regarding the animal in law, ethics, and society. The database contains all Swiss animal welfare-related criminal sentences that have been reported to the Federal Food Safety and Veterinary Office (FSVO) and provides insights into the criminal enforcement of animal welfare. This section contains an overview of the current dog laws in the 26 Swiss cantons in the original languages. The encyclopedia of animal law contains the most important animal welfare related terms and explains their legal nature. 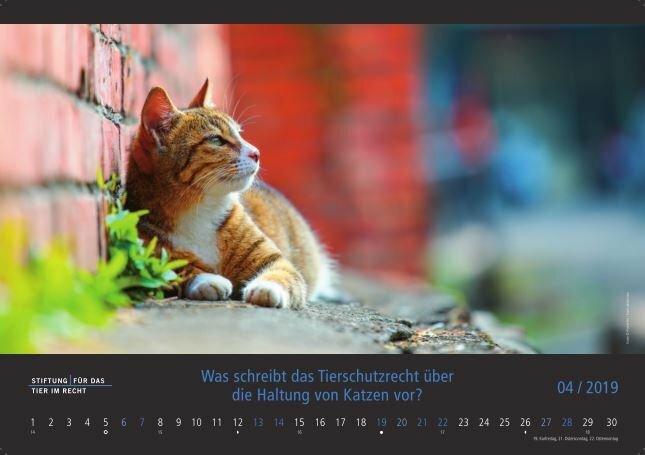 The TIR calendar is quite popular because it not only contains wonderful animal photos but also answers a monthly question regarding the human-animal relationship. April is dedicated to the question "How does the Animal Welfare Act (AWA) regulate cat ownership? ".